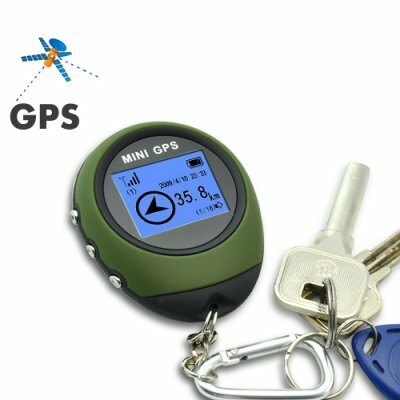 Successfully Added GPS Receiver + Location Finder Keychain (PG03 Mini GPS) to your Shopping Cart. What makes this GPS receiver special? Unlike other GPS receivers, this GPS receiver comes with a DOT matrix display. This means you can actually see what you’re doing, such as when selecting a feature or activating a function. Most GPS receivers rely on the user to memorize a sequence of commands in order to operate their GPS location finder, (boring). Actually having a screen and seeing what exactly you're doing, makes all the difference in the world. This GPS location finder can also store up to 16 POI (Points of Interest). Most GPS units can only handle a few, and they don't even come in a compact form factor such as the TR09 GPS receiver and location finder. Perfect uses for this GPS receiver and location finder include mountain climbing, hiking, bike riding, camping...the list goes on. Whether you're out and about or going on a holiday, this GPS receiver can show you how fast you're traveling and at what altitude, as well as display your exact geographical coordinates in real time. This is a GPS location finder that will never cease to amaze, it can even record your journey and later check to see how fast you've been traveling as well as the total distance traveled. Does this GPS receiver + location finder also use "MILE" as a measure unit for distance traveled? Yes, both kilometer or mile can be selected, just access the setting and select change the measure unit to either KM, or Mile.